Yeah, I was not biased at all. Picked up the Aston for a friend so I can get him started on looking at Hot Wheels, picked up a Mustang because I felt like I had to because Oklahoma made me feel all Murican inside. Porsches for Porsche reasons. Transit was cool cause I liked minivans. The 370Z was because I thought I picked up the red one at K-Day and I ended up not doing so so I'll have to look for a red 370Z in the future. NO wagons but yesterday I saw a sedan 510 at Reasor's and picked it up, ripped card and all and I got that TH RX-7 at a Sears a while ago. 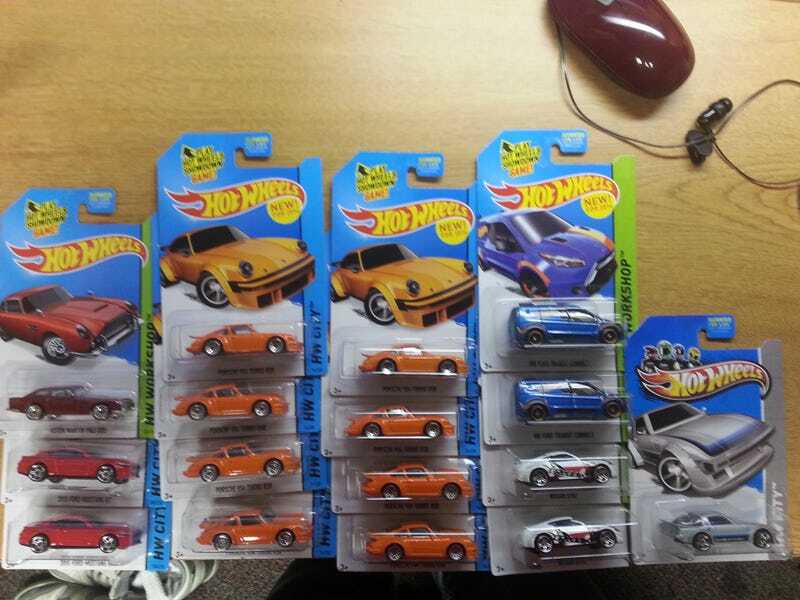 I LOVE PORSCHES I'M NOT A SCALPER I JUST WANTED ALL OF THEM. And from my Porsche hoard I gave how ever many the people there wanted who asked me if I had all the Porsches because happiness for everyone. And sorry ;-; I can't do any trading for now since I have RA duties and TA duties in college and I'm a little preoccupied right now but I'll dump a list on here as soon as everything settles down.